Shannon Rowbury today announced that after she completes her final race of the season this weekend at the Fifth Avenue Mile in New York she will relocate to Portland, Oregon to be coached by Alberto Salazar as a member of the Nike Oregon Project. The 28 year old San Francisco native was previously coached by John Cook with assistance from Tom Kloos and the Bay Area Track Club. Coach Cook guided her to World Championships 1500m bronze in 2009 in Berlin, 6th and 7th place finishes in the last two Olympic Games and two USATF outdoor 1500m titles (2008 & 2009). 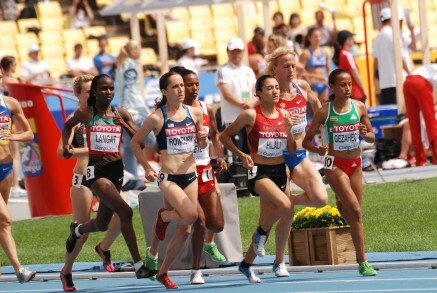 Last month she placed 7th in the 5000m in the World T&F Championships in Moscow. “I would like to thank Coach Cook for everything he has done for me since I graduated from Duke University in 2008. He has taught me so much and I will remain close to him. I wish him a happy and stress free retirement/semi-retirement not having to plan my next workout or worry about my weekly mileage.” Earlier this month Shannon announced her engagement to Mexican 1500m runner Pablo Solares. Over the next few years with guidance from Alberto and his staff at the Nike Oregon Project Shannon will look forward to challenging for more medals and improving her personal best performances – 800m 2:00.47 (2010), 1500m 4:00.33 (2008), mile 4:20.34 (2008), 3000m 8:31.38 (2010) and 5000m 15:00.51 (2010). For further information on Shannon visit her website www.shannonrowbury.com or follow her on Facebook Shannon Rowbury, Twitter @shannonrowbury or Instagram ShannonRowbury.